From the development of fish farming technologies of commercially important fish to practical models of industry-supporting research and completely farm-raising bluefin tuna, the Aquaculture Research Institute aims at attaining the world's highest level of research and education. The bluefin tuna is the most prized of 1he tuna family. It is a large fish that grows to 3 m in length and 500 kg in weight as an adult. As the result of its good taste and high price, it has been overfished in recent years, resulting in the decrease in numbers. 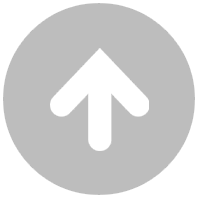 As a countermeasure, action has been taken worldwide to reduce catches. Today, a large quantity of the marketed bluefin tuna is farm-raised, which comes from wild-caught seed that have been raised to marketable size. If the fry are overfished, it is foreseen that farm-raised numbers will also decline. 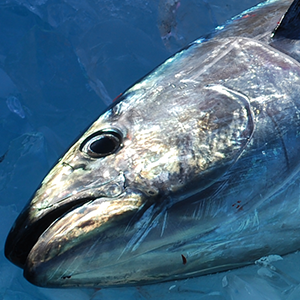 To maintain supplies under such severe conditions, technology for completely farm-raising bluefin tuna is needed. This technology Involves raising artificially hatched larvae to adults, collecting eggs from them and artificially hatching those eggs to create the next generation. The fish are farm-raised in all stages without requiring wild stock. Adults The fish become adults after five years of cultivation. They grow to 2 m in length and 200 kg in weight. Fertilized eggs The Fertilized eggs float to the surface where they are spawned. Being just 1 mm in diameter, it is estimated that several million eggs are collected from a single mother. Hatched larva The eggs hatch in about 48 hours. The hatched larvae are about 3 mm in length. They are initially fed plankton. Fry About 20 days after hatching, the larvae grow into fry. 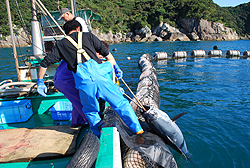 At this time, the fry are moved from land-based tanks to nets in the sea. Younglings Roughly 3 months from hatching, the fish are about 30cm in length and weigh about 300g. Adults In about 3 years, the fish become adults more than 1m in length and 30kg in weight. They are shipped at this size. The Aquaculture Research Institute launched research in completely farm-raising bluefin tuna in 1970. Success came in June 2002. It took 32 years because the bluefin tuna is a delicate fish and little was known about its habitat. The key was to consistently monitor the fish. In the research process, It was discovered that the artificially hatched fry died suddenly. Therefore, various steps were taken to ensure an appropriate environment for cultivation. Eggs were then harvested from the fish once reached to adulthood, which completed the life cycle. Because the results were epoch-making and established the core technology in aquaculture research, future research was adopted for the 21st century COE Program of the Ministry of Education, Culture, Sports, Science and Technology. Research will be continued to improve aquaculture technology for other commercially important species besides the bluefin tuna. In 2003 and 2008, the Aquaculture Research Institute was selected as a "center for the farming production of bluefin tuna and other fish" under the 21st Century COE Program and "international education and research center for aquaculture science of bluefin tuna and other cultured fish" under the Global COE Program, respectively supported by the Ministry of Education, Culture, Sports, Science and Technology that aims to create world class centers of education and research. The activities that led to the complete farm-raising of bluefin tuna were reported in many major and local newspapers including the New York Times (September 27, 2006), Asahi Shimbun (October 8, 2006) and the Mainichi Daily News (February 24, 2007). The program was also reported on TV via NHK's "Project X" (aired July 5, 2005) and "Close-up Gendai" (aired September 26, 2002) as well as by the BBC of the UK, and in Korea and Taiwan. 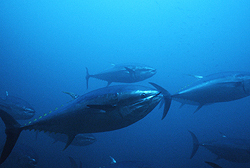 The "development of technology for completely farm-raising bluefin tuna" was given the Award of Excellence at the 2005 New Business Awards, the Award of Excellence at the 2005 Nikkei Sangyo Shimbun Awards for Products and Services and 2004 Honors for Private Sector Research and Development in Agriculture, Forestry and Fisheries of the Ministry of Agriculture, Forestry and Fisheries.